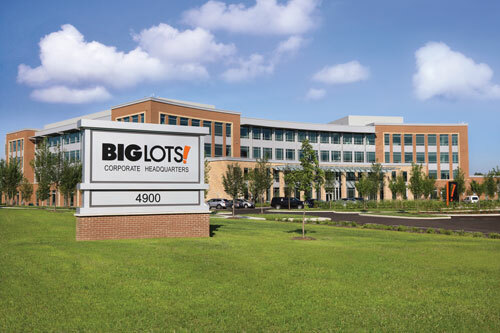 Discount retailer Big Lots has been a staple in the Columbus community since its foundation, and with its new headquarters in the city, the company plans to stay for many more years. In late August, the retailer named Bruce K. Thorn as its new CEO, replacing former CEO David Campisi, who retired in April. Thorn comes to Big Lots from Tailored Brands, a Texas-based retailer of men’s clothing that operates store brands that include Men’s Wearhouse. In May, about 800 corporate employees moved from the former headquarters on Phillipi Road on the city’s west side to the new 300,000-square-foot facility in northeast Columbus. “The building over on Phillipi was over 50 years old and we frankly just outgrew it. We needed to have a space that could accommodate the growth that we’ve seen and really provide a much better work environment for our associates,” says Andrew Regrut, vice president of Investor Relations for Big Lots. The new facility near state Route 161 and Hamilton Road boasts many amenities including a high-end fitness center, a café and a presentation studio set up like a Big Lots store. The studio allows employees to try out displays and merchandise assortments before they head to the stores. “Our new Corporate Headquarters offers our associates amenities and a more efficient use of space, which has been expressed as the No. 1 concern by our team in our annual cultural engagement survey. 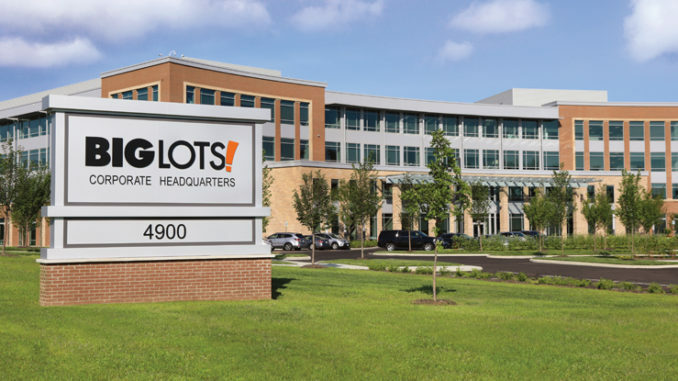 We are very proud of our new work environment and believe it paves the way for Big Lots to continue to attract and retain world-class talent to better serve [our clients],” Tim Johnson, executive vice president, chief administrative officer and financial officer, said in a statement. The headquarters move is among several recent changes to the company as it adapts to an evolving retail climate. Big Lots supports many national and local nonprofits, including Nationwide Children’s Hospital, Pelotonia and Feeding America. In April of 2016, Big Lots began selling products online including some furniture, seasonal and home goods. Adjusting to the current atmosphere also involves steadily closing stores to deal with an oversaturation of retail markets and the national increase of online shopping. Since 2014, Big Lots has closed between 1 to 2 percent of its about 1,400 stores each year, Regrut says. Regrut credits the company’s leadership to foreseeing market saturation and closing stores when other retailers were opening new ones. Sales companywide have been fairly flat recently with increases in comparable store sales offset by a smaller number of stores, Regrut says. “We’ve had the good fortune of not opening stores when we didn’t need to and focusing on the shopping experience in existing stores,” he says. In September 2017, Big Lots rolled out its new store layouts to make them more inviting and easier to shop. The “Store of the Future,” as the company calls it, features furniture in the middle with seasonal items and home goods on either side plus food and other consumables in the back. The layout includes a low-to-high profile, so it is easy to see everything that is offered, as well as more welcoming signage, Regrut says. Customers have given the layouts good reviews and are buying more on each visit. Big Lots plans to redesign about 45 percent of its stores by 2020. 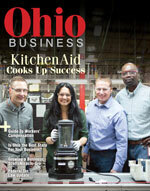 The first redesigns were at 10 stores in Columbus so executives could easily monitor the process. Big Lots has had ties with Central Ohio since 1967, when Sol Shenk founded a company that made closeout deals mostly on vehicles and auto parts. The company began operating as Consolidated International in 1970 and launched the Odd Lots/Big Lots chain in 1982. The City of Columbus worked diligently to keep the company’s headquarters within its borders. The city gave Big Lots a 10-year property tax abatement, which adds up to between $8,480,018 and $12,720,026 in estimated savings over a decade. City officials wanted to keep the company’s income tax base, says Steven Schoeny, the director of Columbus’ Department of Development. The city looked at “what really is right for the business and what does [Big Lots] need to do to make this huge investment in the city of Columbus?” Schoeny says. Columbus officials worked with developers to come up with a master plan for the area on state Route 161, he says. The property is fairly isolated right now, but other businesses have shown interest in building near it. The site is also about 5 miles from the shopping and business hub, Easton Town Center. “Big Lots has been a member of the Central Ohio community for over 50 years and as we looked to move into a new, modern facility, it was important to the leadership team to continue this partnership for many years to come,” said Johnson in a statement. 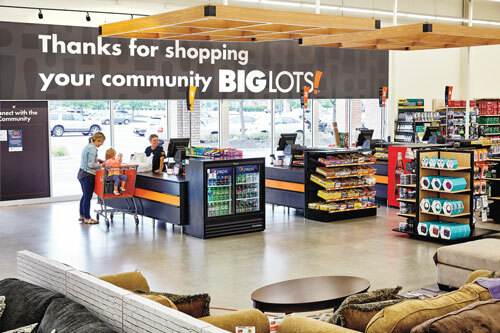 In addition to staying in the city limits, Big Lots connects with Columbus by working with local charities including Nationwide Children’s Hospital and Pelotonia, an annual bicycle ride supporting cancer research. Nationally, the company supports many other programs including Feeding America and local charities. Big Lots plans to donate $50 million over 10 years to help Nationwide Children’s Hospital build a behavioral health pavilion. The hospital has an ambitious and expensive plan for behavioral health services, and it could not complete the project without Big Lots’ support, says Stephen Testa, the president of Nationwide Children’s Hospital Foundation. Testa and his team have met with many Big Lots employees from corporate leadership through store associates, and Testa is impressed by the commitment and passion the employees have for helping others.